We’ve run the numbers and we are proud to announce that DNASTAR software continues to be the most widely cited sequence analysis software in peer-reviewed journals. To date, our software has been cited over 65,000 times. 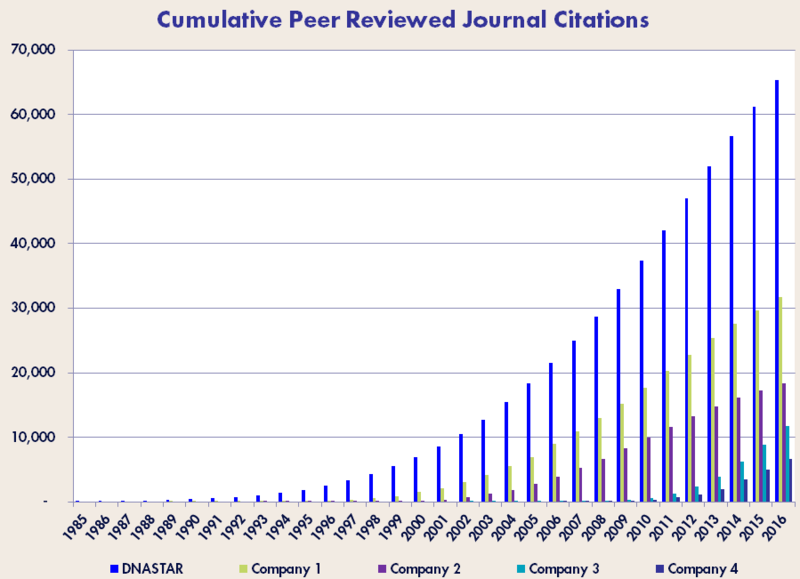 In 2016 alone, DNASTAR software was cited in over 4,000 publications! Last year, and every year since 1985, our software has been cited more than any of our commercial competitors. We are proud to see our users’ work published month after month, and we are honored to be trusted by so many researchers around the world. Check out the Publications section on our blog to see how others have used our software for different project types, from molecular biology to genome assembly, gene expression analysis to variant detection, and more. And remember to cite DNASTAR in your own publications!